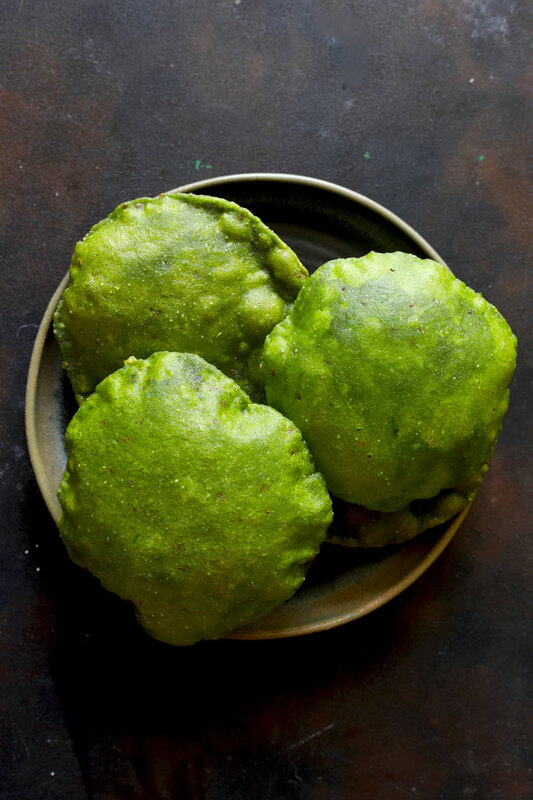 Palak Puri is an excellent way to eat spinach and boiled potatoes together for breakfast. 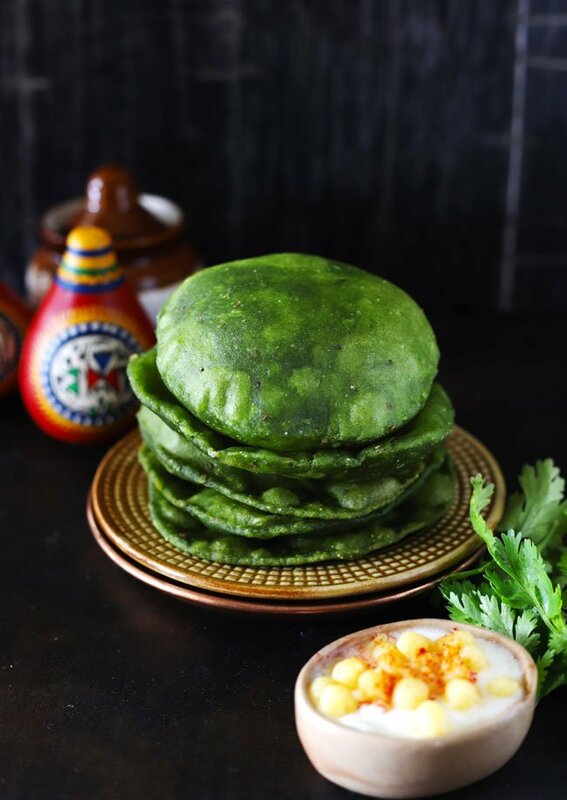 There is nothing not to love about the palak puri. It is a deep-fried green goddess perfect for breakfast, lunch or teatime snack with a cup of tea. Enjoy it while it is hot and puffy with a spicy curry or packed off into a lunchbox with a pickle. All of us have many stories attached to poori. They’ve always been right up there on the list of my favorite Indian breakfast. 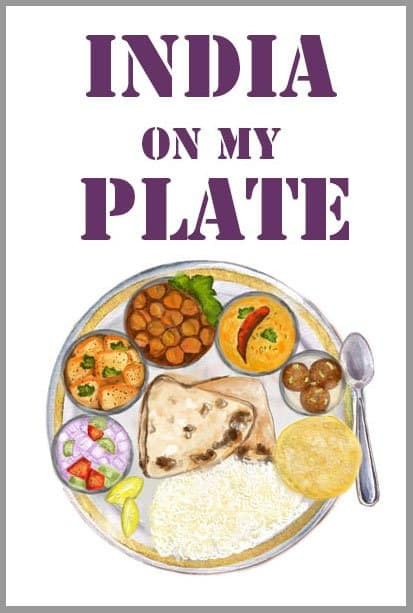 Can anything else match up to the feeling of poking a finger into a puffy hot palak puri and then tearing a piece of it to sweep into a Mathura style aloo ki sabzi? Surely a gratifying and indulging Indian breakfast recipe (also read: 10 Best Indian Breakfast Recipes). 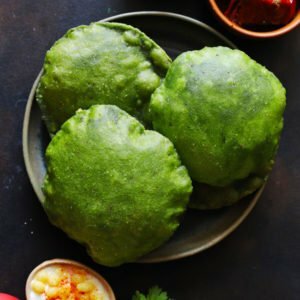 The same spinach poori dough can be used to make palak paratha as well. 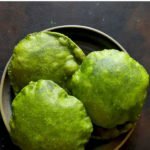 How To Make Perfect Palak Puri? Never boil the spinach (palak) for too long. Don’t over blanch the spinach – about five minutes in enough. Heat kills the bright green color and most of the spinach nutrients. Always, grate the boiled potatoes instead of mashing to avoid any lumps in the puri dough. Use ajwain (carom seeds) for a nice flavor and they aid in digestion as well. For crisp and non-greasy puri, don’t forget to add semolina (sooji/rava). Don’t over-fry the pooris on very high heat or you will lose the green color and brown spots might appear. While frying the pooris, gently press them with a spoon to help them puff up nicely. 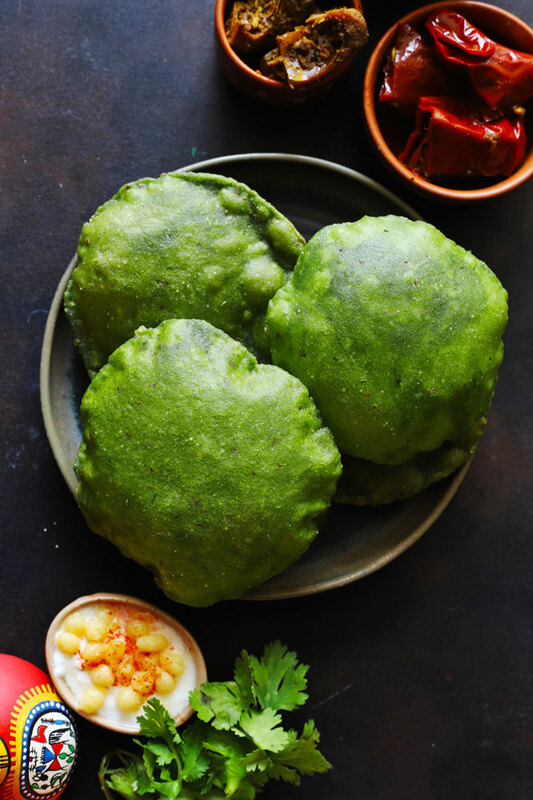 Palak Puri is a delicious poori recipe prepared with fresh spinach leaves. Learn how to make spinach poori with this recipe video. Wash the spinach leaves in running water. Heat a large pan full of water. Add a pinch of salt. Once water starts boiling, add spinach leaves. Cook exactly for 5 minutes. Turn off the heat. Drain in a colander and let them cool down before grinding to smooth paste. In a mixer, puree blanched spinach leaves, ginger and green chili to a smooth paste. Transfer to a bowl and keep aside. In a wide mixing bowl combine flour, grated potato, carom seeds, salt, oil, and spinach puree. Mix them well together to form a stiff dough. Use little lukewarm water (if required) to knead the dough. Make sure dough should be firm in texture yet pliable. Keep covered in the fridge until required. Divide the dough into small balls of equal size. Roll each portion into a round using a rolling pin. Now heat oil in a deep frying pan over medium-high flame. Add a pinch of dough in the hot oil. If the dough floats to the top, oil is ready else heat it for a little longer. Slide one poori from the side into the hot oil and gently press it with the slotted spoon. Once spinach poori puffs up, flip it gently. Using a slotted spoon, drain the puri from the oil. Transfer hot poori to a plate lined with an oil absorbent sheet. Similarly, prepare rest of the poori as well. Serve palak puri warm with aloo ki sabzi and raita. *Did you make this recipe? Don't forget to give it a star rating below. This is my six year old’s favorite. Can we leave the potato out and just knead the dough with only spinach mixture.